Modern-day Belarus holds a laudable spot in the international sports community. Regularly taking part in the Olympics, Belarus consistently ranks in the top twenty of the world’s sporting powers. Recently, a distinguishing characteristic of life within Belarus has been sport. Belarus’s leaders urge citizens to make sports an important part of their everyday lives. The essence of the drive toward sports is not just competition, but also individual health improvement, with the ultimate goal of improving the nation’s population as a whole. All over Belarus you can find ice rinks, soccer fields, basketball courts, and volleyball courts. Belarusian athletes place well in international competitions in wrestling, tennis, and hockey. Speaking of which, at the recent World Hockey Championships held in the capital of Belarus, Minsk, the Belarusian ice hockey team upset the American team, beating them 5 to 2. That might just have been the best game in the history of Belarusian hockey. Belarusian wrestlers are considered among the best in the world in their field. One extraordinarily successful Belarusian wrestler, Alexander Medved, held the title of World Champion seven times and won the Olympic championship in freestyle wrestling three times. Other famous Belarusian fighters who placed at the Olympics include Oleg Karavayev, Kamandar Medjidov, Alim Salimov, and Igor Makarov in Judo. Of course, everyone knows the world famous tennis player, Maria Sharapova, whose parents hail from the second-largest city in Belarus, Gomel. Thoughtful and astute, Belarusians know that sports don’t only bring happiness during victory, but also promote peace in general. The country boasts more than 25,000 stadiums, fitness centers, soccer fields, courts, pools and other sports facilities. Along with Minsk, each district center includes a sports plaza with a covered ice rink. The country has more than 250 sports schools for kids! Belarus is a nation of sports! Since ancient times it’s been well known that when the Olympics started, war ended. Oh Sport! You Are Peace! Sports keep you physically fit, increase your heart rate, and prolong your life. The most exciting person in an action movie? The buff sports figure. Sports are life! Movement is living!. “Happiness depends upon ourselves,” say Americans. “I count him braver who overcomes his desires, than he who conquers his enemies, for the hardest victory is over one’s self.” You can attribute this saying to any Belarusian. They are not only sports fans, but avid participants. flying around the rink, circling past half of the team, until the opponent’s goalkeeper suddenly catches a last second glimpse of the puck flying past him into the net. Spectators come to watch Mark Spitz and Michael Phelps swim faster than anyone else in the world. Oh Sport! You put on a show! Fans cannot get enough of watching sports! 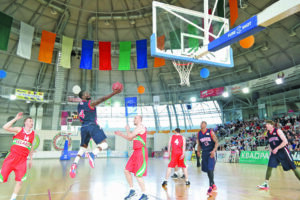 In order to provide more matches, the American embassy and Belarusian Basketball Federation are working together on developing basketball, allocating money to the building of community courts and facilities, and by promising young Belarusian players travel to America. 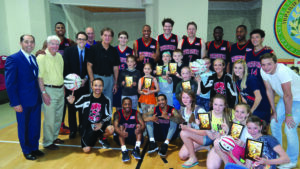 The athletes attend NBA and WNBA games and even meet American basketball coaches. One other point I neglected to mention – Belarusians are familiar with many current and former American athletes such as Michael Phelps, Tiger Woods, Justin Gatlin, Jesse Owens, Carl Lewis, Michael Jordan, Shaquille O’Neal, LeBron James, and many others. T-Shirts depicting Michael Jordan and the giant Shaquille O’Neill can be found in Minsk, Brest, Vitebsk and other Belarusian cities. The universally known painter, Marc Chagall, was born in Vitebsk; art lovers know that his works featured characters flying about like Michael Jordan at the hoop. Or you might instead say that they flew about like Belarus’s accomplished gymnasts and Olympic champions, Nellie Kim, Olga Korbut, and multiple-time world champion Vitaly Scherbo. (On a side note: Belarusian gymnasts are among those who have coached the American gymnastics team). plays for the New York Islanders in the NHL, and the Kostitsyn brothers, Sergei and Andrei, are former NHL players that now play in the KHL (Kontinental Hockey League). Did you know that the Belarusian President, Alexander Lukashenko also plays hockey? At 60, Lukashenko hits the ice and scores! What an example for other leaders! Notably, the International Ice Hockey Federation (IIHF) championship games took place in Minsk. Celebrated throughout the republic, the event included both Belarusians and visiting foreigners. Americans especially enjoyed the games, while sweating over the outcome of their national players: Murphy, Reilly, Sexton and many others. Surprisingly, the Americans took a worthy third place in the world championship, despite many players being unable to participate because of the ongoing NHL season. We understand that, for Americans, excelling in the NHL is more important than winning a world championship. And how about the Belarusian tennis star, Victoria Azarenka, flying back and forth on the court? In her time, Victoria (of course her name means Victory) held the ranking of top racquet in the WTA, even ahead of the tremendous American sisters, Serena and Venus Williams. Victoria now serves as a Goodwill Ambassador to the United States, and she often teaches masters classes at colleges for American girls. American schoolgirls thank Victoria with their unforgettable smiles. Oh Sport! You foster friendship! Sports transcend borders. Most of the Belarusian athletes who work with Americans speak English. The language barrier which existed during Soviet rule, when cut off from the outside world, practically disappeared once the Iron Curtain fell. Belarusian school students now study English as a mandatory second language. Belarus loves to receive visitors and welcomes them often. 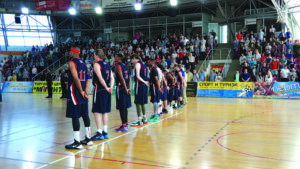 In May, 2015, a team of veteran NBA professionals ventured to Belarus on a friendship mission organized by the Florida Spiritual Diplomacy Foundation and headed by Mikhail Morgulis and Bill Alexson. Thousands of fans expressed unforgettable emotions; they watched the games while holding their breath. The veteran athletes suddenly appeared young with the rapt attention of Belarusian beau- ties and the jubilant atmosphere of the event. The competitors bedazzled the audience with freestyle antics and slamdunks. Afterwards, the athletes addressed the teens in the crowd, “Don’t do drugs or drink! Play sports and be healthy and strong! Your wonderful country needs you fit and well!” Of course, the kids delighted at receiving basketball souvenirs and in taking selfies with the “greats” of the NBA. The American athletes left Belarus sadly; they had fallen in love with the gracious public, the happy faces, and the affable eyes of the girls and boys. For Belarusian people, these types of experiences are the best way to promote an understanding of American spirituality and the American way of life. Furthermore the gatherings promote mutual compassion for humanity. It’s unfortunate that politicians disregard athletes, but then again, not everyone can keep pace with Carl Lewis or jump higher than Michael Jordan! OhSport!Youbuildthebridgeoftrust! g Belarus welcomes American athletes!